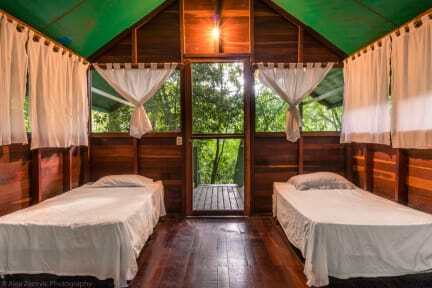 Chaltunha Hostel is set in the lush hilltops of San Miguel, Flores. We are a true backpacker’s hostel that caters to budget travelers from all over the world. We accommodate you in beautiful Caribbean style bungalows with sweeping porches. On our swimming pool One can enjoy a cocktail, relax or soak up the Guatemalan sunshine with the best views of Isla de Flores. On our place you can organize tours and next destinations on our agency . We also have our own shuttle to San Ignacio Belize. The hostel offers free WiFi an in-house bar, breakfast and laundry service. The extend fruit garden that goes from the house to the pool also provide guests with endless places to relax or socialize. If you don't find availability online for your selected days, try showing up and we'll do our best to squeeze you in!! Chilled hostel with a beautiful view. Located a short 5min boat ride from Flores island, the hostel property is really amazing. Highly recommend if you're spending time in Flores or even if you're just passing trough to see Tikal. The owner is an awesome guy and was super helpful with planning the next phase of my trip. Hope to be back soon! Even with differences between the actual facilities and description, we loved our stay here. It’s a bit farther out so it’s very chill and has an unbeatable view of Flores. The New Years firework show wer incredible. The cabanas are kind of summer camp style but wayyy cleaner. The bathrooms were also super clean. The WiFi in the common area was fast. There was no restaurant so you either had to go to Flores or Casa de Grethel. Also, the boat shuttle was not free so you had to pay 10q round trip. nice clean place, great view. it's far from the hustle and bustle of the city but only a short boat ride away, so if you'd rather have it more laid-back this place is perfect! Beautiful cabins, nice view from the common area. Only problem is that nobody is really working there.. staff is only around at random times. Not right on Flores, you do have to take a boat across, however that does give you great views of Flores and it's super easy to catch a boat across. Liked feeling like we were more in the jungle in the little cabins. Only major downsides while we were here was that there was absolutely no atmosphere and the pool was definitely not swimmable. Would recommend if looking for a super chill vibe. You have to take a boat over the river from Flores, this was not difficult to do as boats were regular, but this did cost 5 quetzales a time and we also avoided being out late at night as to not miss the last one. There wasn't much of an atmosphere, dorms were in nice caribean huts a little way away from the main house, where the owners lived. It was noisy at night from cockerels and dogs barking, if your a light sleeper bring good ear plugs. Swimming pool looked like a pond and there is no bar. There is a rooster that lives behind the bungalows and will wake you up at 4:30/5:00 am and not stop crowing... If early mornings are your hung great if not think about some place else. Also no parties or places to go eat in San Miguel. The WiFi is only in the main area. The huts you sleep in are set a ways back into the property. I can't say well anything about the staff. The hostel owed me money. They didn't have change. There is no bar or food. It is disappointing when you are outside the town. This hostel really seemed like they did not care about it or the people in it. I would not stay here if I were you. While showering there appeared to be a short on the shower head and the hostel caught on fire. There was no care in the world from the owners. Their only concern was if the fire stopped. Not once were we asked if we were ok. We asked for a different room and were told none were available. I was told "what is it that you want? You want to finish showering?" and was directed to the common showers. We booked a private. I've requested a full refund and it's been several days and no response.